Tablecloth overlays bring a beautiful splash of vivid colors and life to a wedding or any other special event table decor. They add refinement and class and lift up the decoration of the landscape instantly. When you want something that gives your table presentation a truly stylish and glam up appearance, the collection of satin, lace table overlays presented at BB Crafts are a must-have. Considered as a staple in any special event table decorations, our assortment of all types of table overlays like wedding table overlays, fits well to all the requirements of event coordinators, wedding planners and even to the do it yourself couples. Offered in a comprehensive array of colors as well as shapes, like square overlays, this table decor can complement myriad color blends. 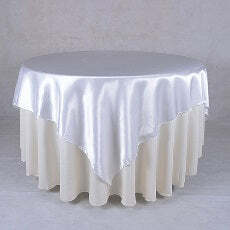 They also make a great pairing with other decoration accents such as table runners or chair sashes. Create a splendid multi-length table setting that your visitors and guests will think of for years to come. Find the perfect table overlay with BB Crafts.